AN almost entire new set of players and team officials have been named to mount a challenge in the President Cup’s football campaign in 2013. Only seven players from last season’s (2012) squad of 25 have been registered with the Football Association of Malaysia (FAM) for the 2013 season. A new set of team officials have also been assigned to lead the team. The seven players who will represent Kedah again next year are goalkeeper Mohd Farhan Aswad Badrisham, Mohd Akmal Chin, Asnan Ahmad, Mohd Shazuan Mohd Ashraf Mathews, Abdul Halim Saari, Lew Han Hung and Mohd Shamir Azreen Hishamul Anuar. Three more players from the Tunku Anum sports school team which won the Minister of Education Challenge Cup for three years running have also been roped in to strengthen the team. They are striker Mohd Syafiq Ahmad and midfielders Mohd Akmal Md Isa as well as Mohd Amirul Hisyam Awang Kechik. The management of the team will be Mohd Asri Ghazali’s responsibility. He replaces Datuk Jeffry Low Han Chau as manager while Mohd Radzi Mat Din will be the head coach replacing Mohd Nidzam Adzha Yusoff. Radzi will be assisted by Mohamad Ramlee and Ahmad Sobri Ismail (goalkeeping coach) with Mohd Idzham Mustaffa acting as trainer. President cup players (yellow jersey) playing a friendly match at the Anak Bukit Istana ground in preparation for the 2013 tournament. Kedah FA assistant executive secretary Zulkifli Haron said that the squad was selected after a month-long trial and selection process. 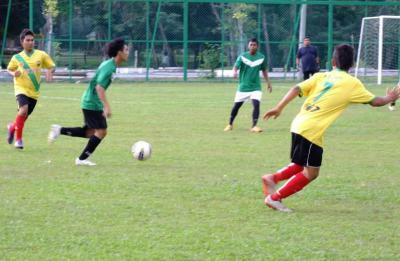 More than 90 players attended the initial trials held on Nov 9 to 10 at the Istana Anak Bukit ground. From the two-day trial, 40 players were identified to undergo further scrutiny. They were tried in several friendly matches before the squad was whittled down to 25. Kedah won the President Cup twice in 2000 and 2003. In recent years, the closest, they came to a final were in 2010 and 2012 where they were beaten at the semi-final stage. The President’s Cup players are: Mohd Farhan Aswad Badrisham, Muhamad Aizuddin Masshar, Mohd Khairul Naim Roslan, Mohd Zulkhairi Zulkeply, Mohd Akmal Chin, Mohd Syafiq Ahmad, Asnan Ahmad, Mohd Aliff Mohd Puat, Ammer Syafiq Abdull Rahman, Mohd Shazuan Mohd Ashraf Mathews, Mohd Rafizol Roslan, Mohd Isyam Syahriza Othman, Abdul Halim Saari, Lew Han Hung, Mohd Nizam Mohd Yusri, Mohd Akram Mahinan, Abdul Muiz Abdul Mutalib, Mohd Akmal Md Isa, Mohd Shamir Azreen Hishamul Anuar, Mohd Aliff Fitri Marzaini, Mohd Azryl Reza Zamri, Mohd Aqmal Alias, Adam Aidil Iskandar, Mohd Amirul Hisyam Awang Kechik, Mohd Zainatul Firdaus Rohani. Meanwhile, two Brazilian players are among 25 players registered to represent Kedah in the Premier League in 2013. They are striker Chayene Medeiros Oliveiro Santos and midfielder Nelson Marcelo San Martin Arriagada. Apart from the two foreigners, eight more players have been recruited to fortify the Kedah team. Among them are former Kedah striker Akhmal Rizal Ahmad Rakhli, Sabahans Zuraindey Jumai and Mohd Fariss Azlan Mat Isa, Wan Hossen Abd Ghani (Perak), Arman Fareez Mohd Ali (Kuala Lumpur), Hariri Mohd Safii (Terengganu), Mohd Shahrul Ezrain Shamsuddin and Tengku Hasbulah Raja Hassan (both from T-Team). The team will be coached by Croatians Marijo Tot (chief) and Antonio Sisic while Abdul Talib Saidi, formerly of Perak, will be the goalkeeper coach. The squad : Abdul Hadi Abdul Hamid, Mohd Muhaimin Mohamad, Mohd Khirul Efsan Md Isa, Arman Fareez Mohd Ali, Hariri Mohd Safii, Mohd Fariss Azlan Mat Isa, Mohd Fazliata Taib, Mohd Sabre Mat Abu, Mohd Shahrul Ezrain Shamsuddin, Mohd Ridzuan Rumlee, Khairul Helmi Johari, Baddrol Bakhtiar, Mohd Syamim Alif Mohd Sobri, Mohd Fiqkry Md Isa, Nelson Marcelo San Martin Arriagada, Wan Hossen Abd Ghani, Wan Mohd Syukri Ahmad, Zuraindey Jumai, Tengku Hasbulah Raja Hassan, Akhmal Rizal Ahmad Rakhli, Chayene Medeiros Oliveiro Santos, Hattaphon Ban An, Mohd Faizal Abu Bakar, Mohd Khyril Muhymeen Zambri. Manager: Datuk Jeffry Low Han Chau. Coaches: Marijo Tot and Antonio Sisic. Goalkeeping coach: Abdul Talib Saidi.